Case128 – Big Fan – Binding Pile! My allergies were beating me up pretty severe when I got up and I’m rather ‘not there’ – even now .. but we’ll see, I might get motivated to do it .. then it’s a matter of printing them out and quilting away .. not a lot of time needed as these are just 3″ borders I think and it’s just a bitty wall quilt. hmmm I might even get this one day during the week .. we’ll have to see what I’m inclined to do after work .. prolly not much with the rain being here that long .. Yesterday was such a teaser day with what we are facing now **sigh … rain rain go away .. don’t bother to come back another day! Have I told you yet that if you need a home/shelter for that baby, I will take it off your hands? 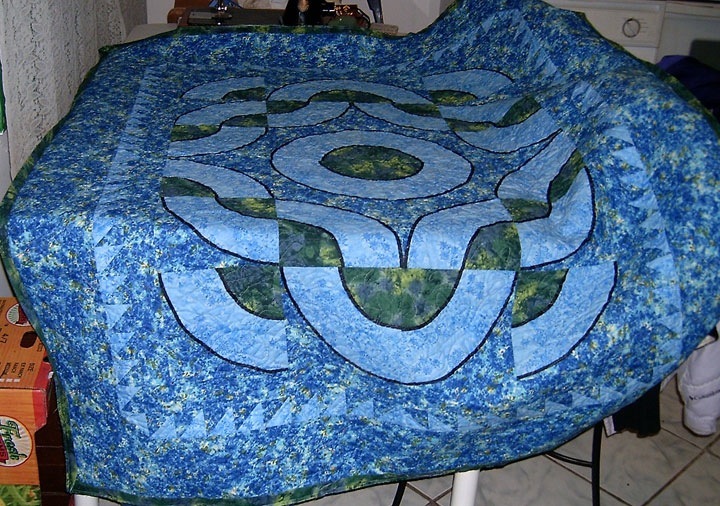 heheheheheheheh Beautiful quilt Gracie, love those blues! Wait till you see the colors in mine…..